A new brochure showcasing examples of best practice farming and food initiatives from around Europe has just been published. 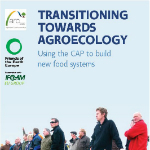 Civil Society platform Arc2020, Friends of the Earth Europe, in association with IFOAM EU, have brought together 10 innovative approaches in “Transitioning Towards Agroecology: Using the CAP to build new food systems”. You can download or view a digital copy by clicking on the image below. Agroecological approaches are a more holistic way to farm and produce food, integrating nature and societal concerns more coherently than the business-as-usual methods of conventional agriculture. Production techniques pioneered the organic farming and food movement, as well as initiatives based on the principle of food sovereignty including shorter and regionalised food supply systems are core parts of moving towards agroecology. 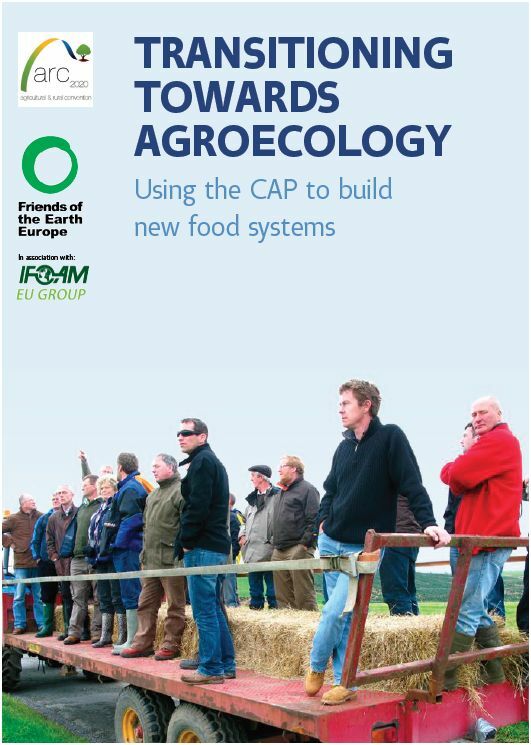 So agricultural, environmental, health and the creation of vibrant rural communities are all part of agroecological approaches championed in this new publication. The brochure showcases not just best practice, but how the EU’s Common Agriculture Policy – CAP – can and should be used to deliver public goods for public services. Best practice examples from around Europe, and from many agri-food sectors, are spotlighted. All were selected because they employ what is termed a 'communities of practice' approach to agroecology. This means that they work as a network of equal participants, with many actors, such as farmers, farming advisory services, local policy makers, food activists, rural networkers, scientists, conservation groups, local development companies and more working together. Ireland. 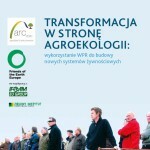 Organic farmers’ beef and sheep co-op and farmer led training initiatives. UK. Land access and vegetable supply network and co-operative regionalised around Manchester. Baltic. Best organic farming practices to reduce Nitrogen and Phosphorus pollution, as well as a networked approach to improving diets. Romania. Participatory seed distribution networks. Italy. 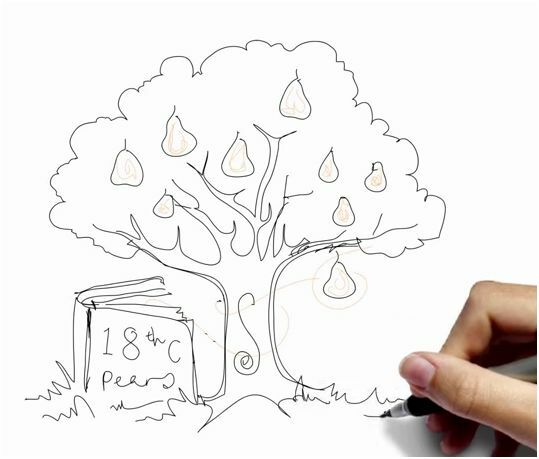 Slow food’s valourisation and marketing of a traditional pear variety. Germany. Permanent grasslands and Ecological Focus Areas. France. The importance of local abattoirs to regional food systems. France. A results-based agri-environmental scheme and corollary flowering meadows competition, which encourages the blossoming of pollinator friendly landscapes. Poland. Organic fruit farmer initiatives to make old orchards in challenging terrain profitable. Greece. Making indigenous olive tress profitable through developing quality taste networks. These best practice case studies are accompanied by six animated videos, one overviewing the CAP and agroecology, the other five representing case studies from Ireland, the UK, the Baltic, Romania and Italy. All videos can be found in a dedicated post on the arc2020 site. Each of these five videos is hyperlinked in the brochure itself, and can be accessed simply by clicking on the hard drawn sketch which accompanies each of the five case studies. 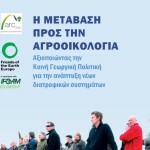 This brochure and these videos “give some clear indications for the priorities governments should have, if they are serious about making good use of public money for supporting and scaling up an agroecological transition” Stanka Becheva Food and Agriculture Campaigner with Friends of the Earth Europe points out. Rural Development Programmes support under Pillar II of the CAP – although underfunded, remain the best vehicle for supporting this necessary agroecological transition – if implemented in the right way. Significantly more of the CAP budget needs to be invested in these approaches to improve the sustainability of the food chain and support sustainable farmers, rural communities and local economies across Europe” concludes Stephen Meredith, Policy Coordinator at IFOAM EU. The project page can be found on the arc2020 website. A post detailing and showcasing the five case study animations, plus an introduction to CAP and agroecology, can be found here. 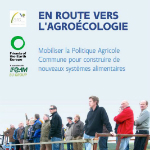 Mobiliser la Politique Agricole Commune pour construire de nouveaux systèmes alimentaires. 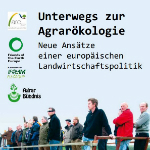 Neue Ansätze einer europäischen Landwirtschaftspolitik. 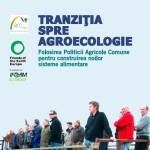 Această publicație intenționează să prezinte exemple de succes din diverse țări UE unde o tranziție spre strategiile agroecologice se întâmplă deja. Publicația dă indicații clare pentru prioritățile pe care guvernele ar trebui să le aibă, dacă sunt serioși despre buna utilizare a banilor publici pentru a susține această tranziție. Acestea sunt numai câteva cazuri din diversele strategii și practici care se petrec deja în UE. In următorii ani grupuri ale societăți civile vor continua să observe implementarea și dezvoltarea PAC prin colectarea altor exemple de bune practici, dar și prin sublinierea eșecurilor modelului agroindustrial, pentru a sprijini în mod activ o transformare de succes. "Στην Ευρώπη, η Κοινή Γεωργική Πολιτική (ΚΓΠ) είναι το κύριο νομικό πλαίσιο που επηρρεάζει την παραγωγή, πώληση και επεξεργασία γεωργικών προϊόντων. Η ΚΓΠ προβλέπει όλες τις κύριες αποφάσεις για την κατεύθυνση της ευρωπαϊκής γεωργίας και τις δαπάνες σημαντικών ποσών από τους δημόσιους πόρους της ΕΕ, ενώ σήμερα απορροφά περίπου 40% του συνολικού προϋπολογισμού της. Η ΚΓΠ μας επηρεάζει όλους, μιας και ευθύνεται για την διατροφή μας, τις αγροτικές μας κοινότητες, την ύπαιθρό μας, την υγεία μας, το περιβάλλον μας και τους αγρότες μας. Είναι ευρέως αποδεκτό ότι η ΚΓΠ έχει ενθαρρύνει διαχρονικά ένα αγροτικό μοντέλο που καταστρέφει το περιβάλλον -συμβάλλοντας στην κλιματική αλλαγή, την απώλεια της βιοποικιλότητας, τη διάβρωση του εδάφους και τη ρύπανση των υδάτων- και έχει προωθήσει τη βιομηχανική κτηνοτροφία εις βάρος του εισοδήματος των γεωργών και των θέσεων εργασίας στην ύπαιθρο." "W Europie Wspólna Polityka Rolna (WPR) stanowi kluczowe ramy prawne wpływające na produkcję, sprzedaż i przetwarzanie produktów rolnych. W ramach WPR podejmowane są ważne decyzje na temat rolnictwa na kontynencie i wydatkowania znaczących środków publicznych Unii Europejskiej - obecnie polityka ta stanowi około 40% całkowitego budżetu UE. Odpowiedzialna za naszą żywność, nasze społeczności wiejskie, naszą wieś, nasze zdrowie, nasze środowisko i naszych rolników - WPR dotyka wszystkich. Powszechnie uważa się, że WPR wspiera model rolnictwa, który niszczy środowisko - przyczynia się do zmian klimatu, utraty różnorodności biologicznej, erozji gleb i zanieczyszczenia wody. WPR promuje także rolnictwo przemysłowe kosztem podstawowych dochodów rolników i miejsc pracy na obszarach wiejskich."